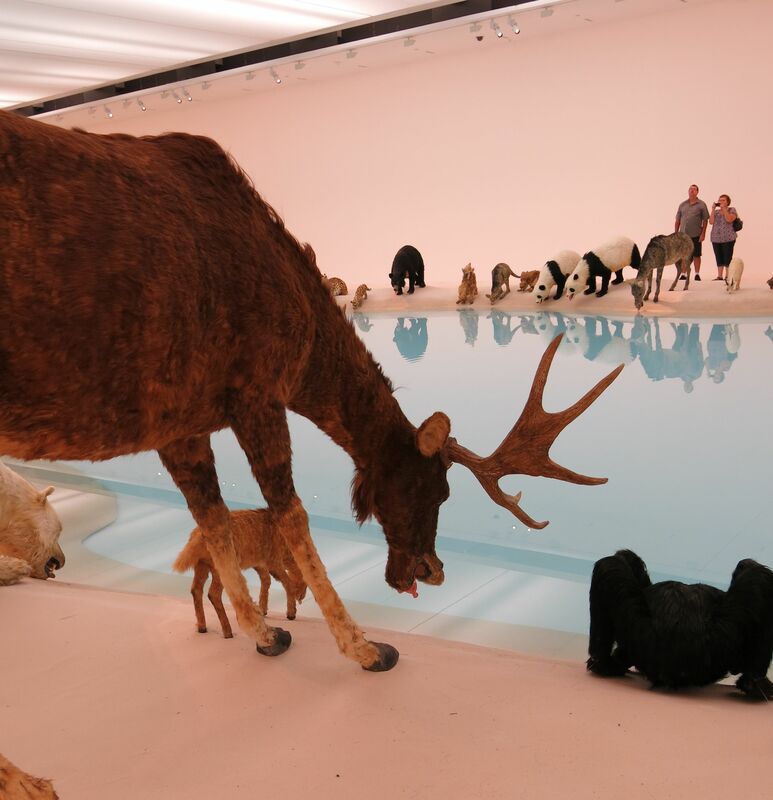 I was pretty excited when I learned that an exhibition by Cai Guo-Qiang featuring lots of animals would be on at the Queensland Art Gallery Of Modern Art. Despite opening late in 2013 I only just went last week. 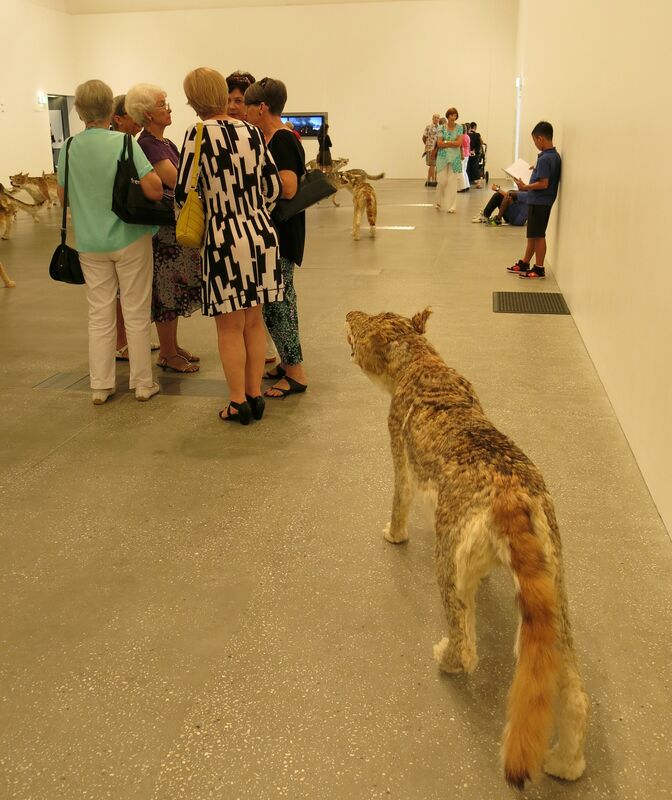 There is some controversy about this exhibition as the sponsor, SANTOS, have recently been responsible for contaminating water during CSG processes, but lets not let that contaminate this fascinating exhibition, haha. 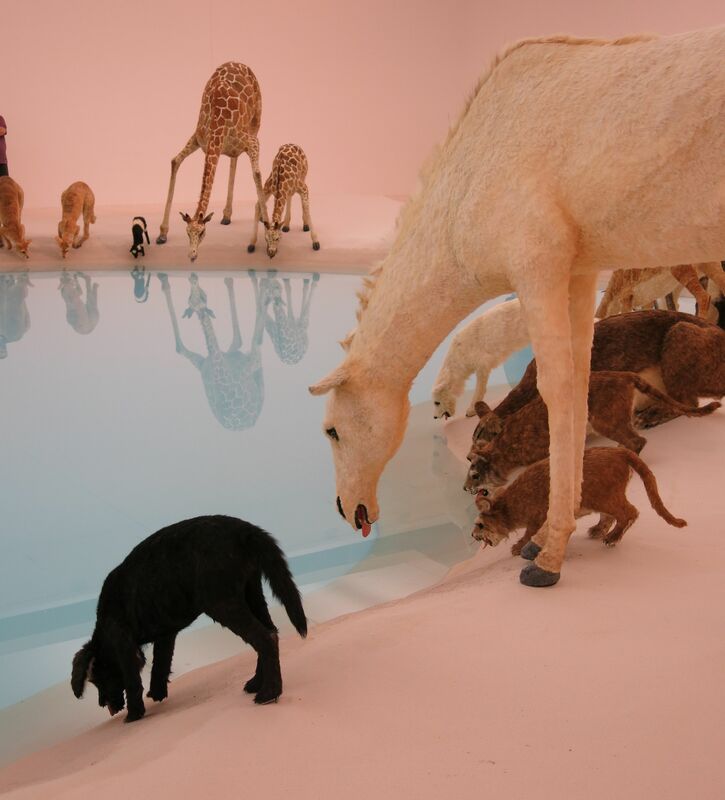 But, really, I think it is kind of apt that the animals are all drinking from a waterhole, all sharing the same water, in the installation, Heritage. The artist says it is paradise, but when I saw it I thought something totally different. To me it was the very last water hole left for the animals to drink from (and it might be contaminated, maybe Heritage part 2 should be a bunch of dead animals around a watering hole). I did not view this as a paradise, but as the last hope for all of them. They were together and sharing as they were all desperate. Ultimately, there was no hope. My camera made all the photos in this room look pink. I like it though. Maybe I was being influenced by going to the museum beforehand and seeing exhibits about extinction. Maybe I just tend to look on the dark side (as opposed to the bright). Maybe I don’t believe in paradise. Eucalyptus, a HUGE Eucalyptus tree laying in the walkway is very arresting. 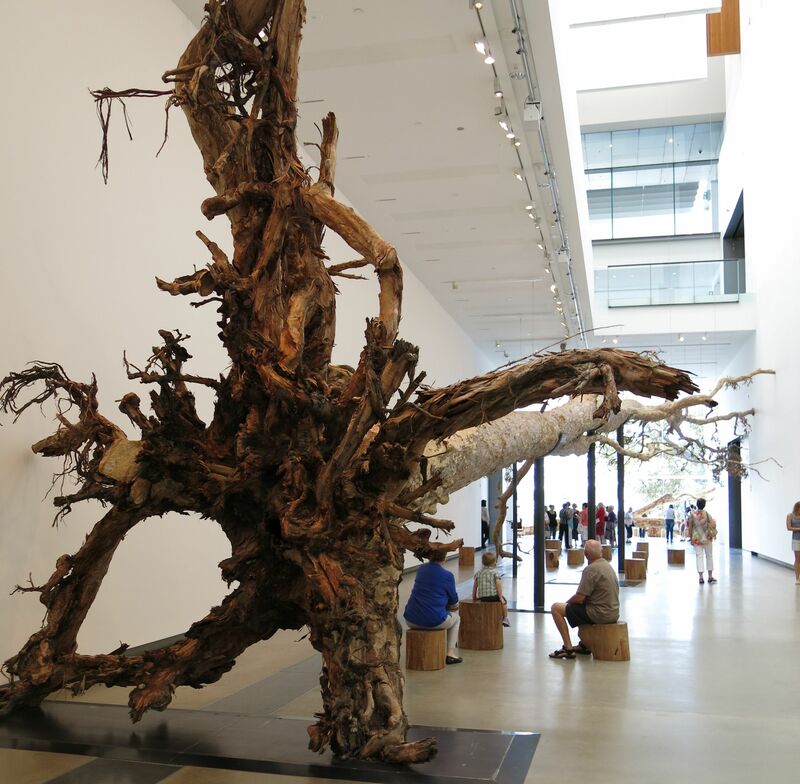 I think the tree works well with the rest of the exhibition. Meant to speak of the cycle of life, this “rescued” tree (it was claimed from bushland being cleared) made me think how much more beautiful it would be where it used to stand, it made me think of cockatoo’s, a declining species due to the clearing of bush and huge trees (cockatoos make their nests in the hollow of trees-from branches falling off). 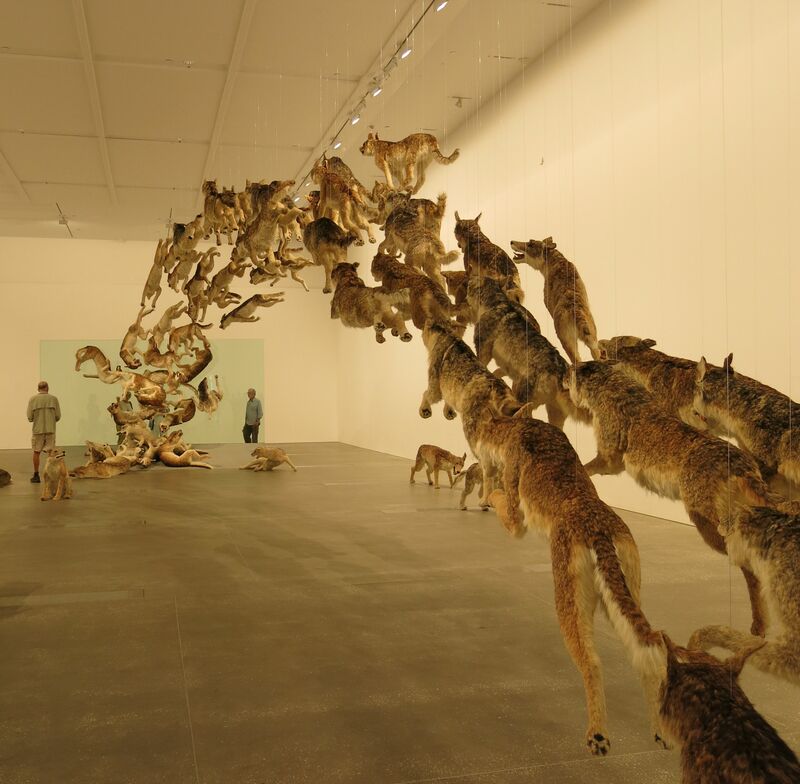 Head On, the wolves smashing into the glass wall. The description in the booklet says “There is the implication that if we blindly follow ideology, or misdirect our strength towards a collected goal, there can be damaging consequences.” Yes, certainly there can be. To me, the most damaging misdirection is not thinking, not considering, that there are many sides to everything, EVERYTHING. There is no black and white, only shades of gray. Maybe that is what I take away from this. Oh yeah and here is a wolf stalking some ladies! I was doing some pretty serious giggling when I spotted this and had to take a photo. In fact I took several photos or this! I LOVE it! This entry was posted in Uncategorized on March 27, 2014 by yourorgangrinder.